ABOVE: The Hotel Olimpia's garden. INSET BELOW: The hotel is alongside the Burchielle Canal. Location: Across a footbridge from the Piazzale Roma. You need quick access to Venice's airport buses, land taxis, or cruise terminals. The Best Western Hotel Olimpia is also convenient for motorists, since it's near parking in the Piazzale Roma and on the nearby island of Tronchetto. The Olimpia is housed in a 16th Century building on the Rio delle Burchielle, the canal that separates the Piazzale Roma from the adjacent neighborhood. 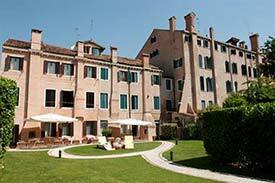 Its rooms are decorated in 18th Century Venetian style, but you'll probably want to go outside and enjoy the hotel's garden in nice weather. In the first photo, the Best Western Hotel Olimpia is near the bottom of the frame, at the eastern end of the Fondamenta delle Burchielle. The grey area above the hotel is the Piazzale Roma, which is served by airport buses, land taxis, cruise-ship shuttle buses, and (between the garages on the left) the People Mover tramway to the Marittima cruise basin and the Tronchetto parking island.